A practical application of convolutional neural networks. You know, I don't think we as a species do enough looking at German traffic signs. I mean, sure, they are there when we drive through Germany, and we do (hopefully) see them, and sometimes we even register their meaning, and alter our behavior based on those meanings. But we don't do nearly enough looking at those bold, blue, red, and white, geometrical pictograms. I think this is a shame, as by virtue of not looking, we do not appreciate their simplistic genius of interlingual communication. 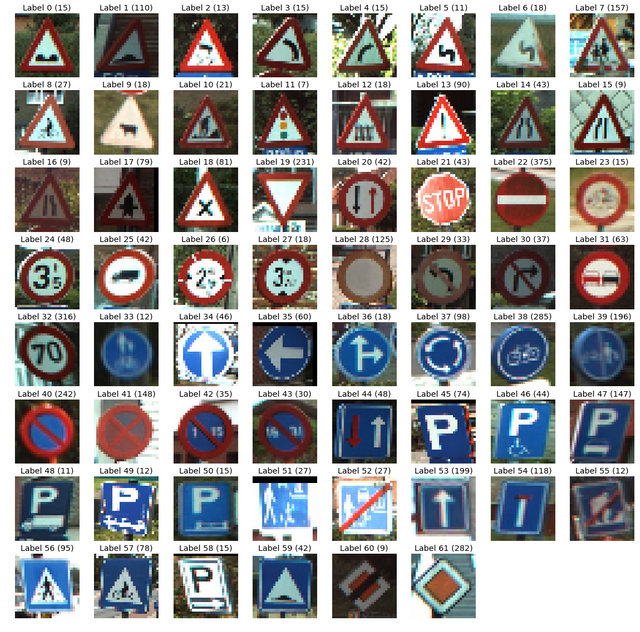 That's why I decided to outsource all the looking to computers a while back when I was toying with an image classifier that would learn to classify traffic signs. This will primarily be a commentary on what I did, and some ideas for what I could change, and do different in the future. Since I used the Tensorflow library, I recommend reading my introduction to Tensorflow if you're not familiar with the library, or just need to catch up. The dataset used was provided by the German Institute for Neuroinformatics (Institut für Neuroinformatik) under open access, and can be found here. Before we begin, we start by importing the libraries needed, and check that all devices are recognized. Next, we load the data. Since it came pre-split into a training- and a testingset, we will just use that as opposed to creating our own split. Notice further that I didn't use the DataHandler described in the post mortem analysis. The reason for this is simply that I hadn't hit on the idea yet when doing this project. In order to use a static neural network, regardless of its architecture, the input dimensions must be the same for all examples. 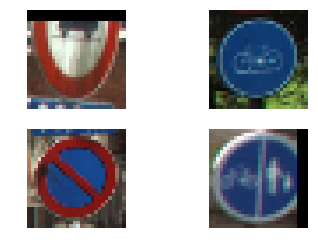 But as if often the case with images, the resolution of these can vary a lot between individual samples. So in order to use them, we have to standardize them before feeding the images to the network. The simplest way of doing this is just to rescale all the images to a common resolution, and it turns out that this is not a bad approach either. Because the images are not of the same aspect ratio, we have to define a mode of interpolation, again, for simplicity, we just fill in black, an do not attempt to do any fancy interpolation which is evident by the use of the constant mode in the following code block. While we could convert the images to grayscale as illustrated by the comment, we don't do this as the colors on the signs are specifically picked to convey information. Also, as we will find later, this is needed due to the poor distribution of the dataset. 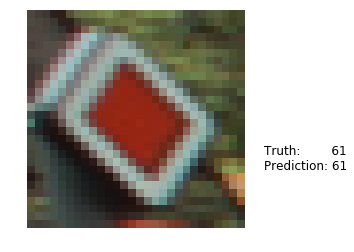 The 28 by 28 pixels were chosen because it's on the order of the resolution of most images, and because it's the resolution of the images in the common MNIST dataset. To check that we have correctly imported the data, we can inspect the data dimensions to assure that we have correctly imported and rescaled the images. Here, it's seen that the number of unique labels are not same for the test and the training sets. 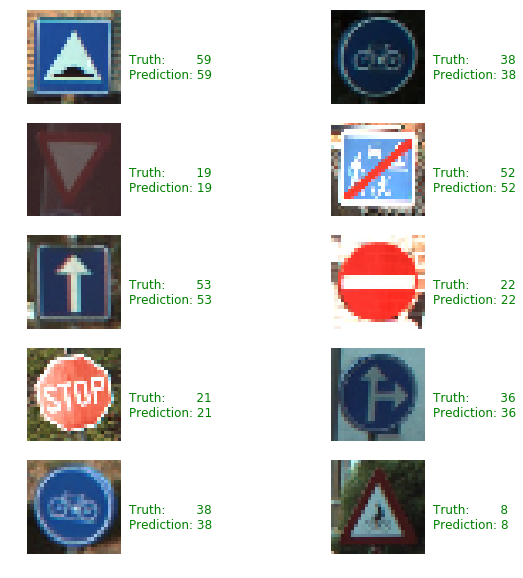 This poses a problem as the dataset is not large enough so that the test segment will test all the types of traffic signs. This means that the network could completely fail on the 9 types of signs that we're not testing, and it'd be difficult for us to find out, especially if it does well on the training data. Furthermore, the measly ~4500 training examples are not a lot when considering that we will, as shown later, have several thousand features. For more insight, we can look at the class distribution of the images. Here goes a similar story. The large variance in the number of samples per label is also problematic as it will be difficult for a network to learn the representation for some of the classes for which there is not a lot of data. I does, however, make sense that it'd be this way; that certain signs are a lot more prevalent than others as it reflects the real world distribution of the different signs. This can be mitigated by just having a large amount of data, but as seen above, this is not the case, and as there's no simple way of getting more data, a lower accuracy is therefore to be expected, and it'll be difficult to fit a complex model, why a very deep neural network will likely not be ideal. Here, we can visually see that the image transformation has worked, and that the images are padded with black bars as expected. This can be extended to show an image for each class label with the code below. 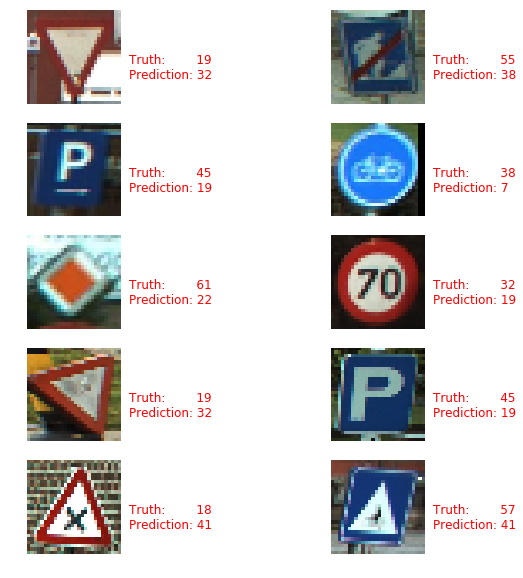 This does not only serve a useful lookup tables to figure out what sign-type the different labels represent, but also confirms our hypothesis that the differences in frequency of individual labels are correlated with the availability of these signs on the streets. For example, while parking directions (label 40,41), and speed signs (label 32) are relatively common, signs signalling a specific height of a structure overhead (label 24,26,27) are relatively uncommon as expected. Now that we have a pretty good understanding of the dataset, and its limitations, we can start creating our classifier model. Due to the quirks of the dataset, we will constrain the model to a single convolutional layer followed by two fully connected layers. For regularization, dropout is implemented. If you aren't familiar with convolutional layers, you can read this introduction (coming soon). We can now train the network using the training operation. Notice that we don't use batch learning (stochastic gradient descent) due to the small size of the dataset. Again, the training error decreases in an inverse exponential manner as expected passing the acid test. Individual samples can now be evaluated by evaluating the final layer's logits. We can extend this to look at a random sample to see what kind of predictions it gets right, and which it gets wrong. # Display the predictions and the ground truth visually. # Run predictions against the full test set. # Run predictions against the full training set. Here it's seen that the model works with a accuracy of 95% on the testset and 99.8% accuracy on the training set. The discrepancy between the testing and training error could be a sign of the network overfitting, and can be combated with more aggressive regularization, and, perhaps, by using fewer features, but this may also reduce the overall accuracy of the network. One thing to notice from the types of errors plotted is that the network frequently predict label 19 over a range of different labels for example 32, and 45 shown here. 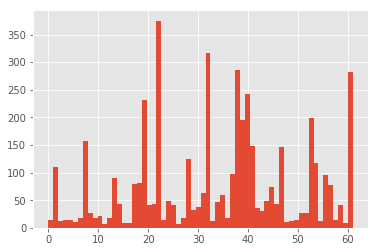 Using the distribution plot above, we see that label 19 indeed is very common in the dataset, so this shows that the network fails to learn the representations of some of the less common classes, and overwrites them with the stronger representation of other signs. It's possible that permuting the data, and thus creating a larger synthetic dataset, will help alleviate the problem. As a final touch, we will save the model, so that we can use it later. While this is not the most sophisticated model, nor the dataset particularly friendly, the model actually does reasonably well with a 95% testing accuracy - which while not great isn't completely terrible either. Moreover, this will probably mark the end of this project; one that I started a long time ago, but never had time to finish. If you enjoy this informal kind of walkthrough, and you want me to do more of these, please let me know on Twitter. In order to prevent identity theft, identity deception of all types, and content theft we like to encourage users that have an online identity, post for a website or blog, are creators of art and celebrities of all notoriety to verify themselves. Verified users tend to receive a better reception from the community. A post or tweet on an established Facebook, Twitter, Instagram or other social media account with a link to your contribution on Steemit. A reference or link to your Steemit account on your website or blog. What if the domain name of the website literally is the name of my steemit account? Isn't that better than a hyperlink which could be placed there by a third party? We are still waiting for your verification Kasper. Creating an account on Steemit with identical name to the domain is not a verification. Anyone can create Steemit account with any name. We deal with too many ID theft on daily basis, so we would recommend confirming your authorship on your website as soon as possible. Or you can e-mail one of steemcleaners members from e-mail address used by this domain. If we don't receive verification, we would need to start blacklisting your account. Who are these developers I can email then? You can e-mail me or patrice in Steemit.chat or Discord. If you contact patrice, please send her link to this post. I'm afraid that I can't seem to find your email. I'm glad that it helped. Thank you for dropping by chat. I've added you to our content verification list.